It was further reported in reference to industry experts, that the Chinese electric car manufacturer Byton is also looking to join the manufacturers that will take advantage of the contract manufacturing of electric vehicles in Gunsan in the future. 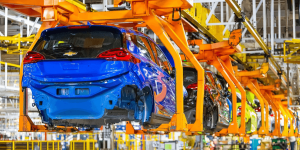 The plant is expected to go into operation in 2021 and initially have an annual production capacity of 50,000 electric cars. By 2025, this figure should rise to 150,000 units per year. These plans are not yet finalized, however, as the handover of the old General Motors factory is only to be concluded on the 29th of June. General Motors closed the plant in May 2018 due to low capacity utilization and savings pressure on the company. In terms of ownership, Myoungshin, a subsidiary of supplier MS Autotech, would initially acquire the plant in full, according to the above-mentioned report. Following that, members of a consortium led by MS Autotech would then join. According to unofficial information, six potential partners are on board, including Sejong Industrial, a Korean manufacturer of exhaust systems, and Byton’s Chinese parent company Future Mobility. The latter consortium deal is also decisive for the expected contract manufacturing for Byton. MS Autotech, by the way, is a supplier with close ties to Hyundai. Since last year, however, the company has also been supplying parts to Tesla. Now it looks as if the company is expanding its core business enormously and is looking for access to Chinese manufacturers. The trend towards China has been observable in the Korean automotive industry for some time now. Last month, SNK Motors announced that it would cooperate with China’s Songuo Motors to build an electric car plant with a capacity of 100,000 vehicles per year. In 2018 Nanos signed an agreement with China’s Chery Automotive with the target of building electric cars by 2021. Both projects are also planned in the region around Gunsan.